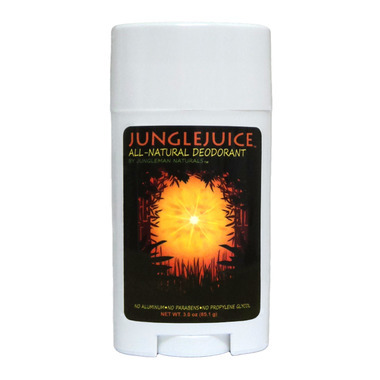 Jungleman All-Natural Deodorant is made entirely from 100% all-natural products, with an ingredient list so short that it can be counted on one hand. From the scorching summer heat of the Australian Outback, to the frigid winter cold of the North American Rockies, to the sweaty gyms of professional mixed martial artists, Jungleman All-Natural Deodorant has proven itself as the safest, most effective, natural deodorant in the world. Yes, it's true. You can be 100% all-natural and 100% odor free at the same time. Ingredients: Organic Zea Mays (Corn) Starch, Sustainable Elaeis Guineensis (Palm) Oil From Non-Peatlands, Sodium Bicarbonate (Baking Soda), Citrus Aurantium Dulcis (Orange) Oil. The worst natural deodorant I purchased until now. Its almost impossible to apply. Doesn't glide on your skin because strange powdery consistency. It also leave traces all over your body and stain your clothes (really hard to clean to get rid off it!). Very disappointed.